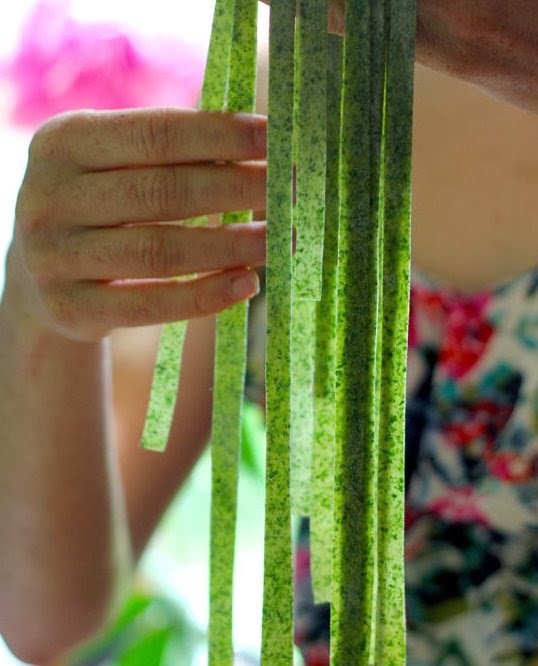 Nettle Fettucine -Absolutely nothing to do with this post!!! This post is a copy of a letter today to friends who were/are a part of a Facebook thread. One of the greatest things about Jesus is He is real. But another thing about Jesus is He doesn't impose. Nancy will know this, but to our generation schooled on church life, the thought that you can actually "go outside" church AND STILL SURVIVE is soooooo major! Like the old Middle Age maps with "Beyond here there be dragons" we were all taught that no Christian can survive without fellowship...that we are absolutely sure of going off the rails if we left the "covering " of the church. until we came to our Chapter 5 of Song of Solomon point where the watchmen that had been so nice and friendly before....start ripping at our Shulammite dresses and leaving us more or less starkers in the town square. And guess what? A lot of us have been out of church for years. And we're still breathing. Many of us have actually grown more and faster than at any other point of our Christian life. But only because we found the same foundation for living that St Paul did in Arabia.....errrr presumably while learning how to knit marquees for a living!!! Only perhaps not all have the same foundation quite...only you can answer that one. St Paul also at least twice we know of, and maybe quite often besides...had experiences with the Living Jesus as He is NOW in the heavenlies. What I like about Daniel Yordy's writing and really what I was trying to capture in the Hindhead Tunnel post is that we are tunneling at both ends simultaneously. John 17 is real NOW. I am in God and God is in me. I am in His Kingdom and the Kingdom is in me. the fulness of the Godhead dwells bodily in My Lord and I am complete in Him. When we say like the disciples....the Kingdom of heaven is at hand...we mean it. The throne of God expresses itself through me, and yet simultaneously I am in the Throne of God in Jesus in the heavenlies. My life is hid with Christ in God. This One Person is doing more or less the same stuff simultaneously through all of us here....yet marvellously in its individuality and context of each of our unique parts to play in this life and in the one to come. Quite how that can be so....is simply amazing. So here is the great truth that God wants to share in the square in Nehemiah 8. Nehemiah is already the return from Babylon, and people came in waves. Why is so much of the gospel to do with "return"? In returning and rest shall you be saved. In quietness and confidence shall be your strength. Ok so what if we blow it? It's more than a "built in" tag on to salvation. right through every return procedure down the ages. Naaman's cure for leprosy was ALL ABOUT RETURN....returning 7 times into the Jordan....and for 6 of them NOTHING OUTWARDLY changed. What does that tell you about God manifesting in sons? Something like there are 7 distinct stages to sorting us out and 6 of them are completely unseen!!!! And the devil leverages the unseen-ness to tell us "see, this gospel never does anything at all"
But another thing returning is about is willingness. A voluntary selfgiving....WHEN WE WANT. Romans 12 1-2 comes at the end of a mighty mighty exchange. If we are not sure of the product benefits, then we don't lay our lives down....simple as that. It's a FREEWILL OFFERING in Psalm 110. God is not interested in anything else. And it's so goood...ofcourse we gather and cut Covenant with the Word together. What was Adam and Eve's feelings about returning before God called out for Adam? Hiding away, plastered with figleaves. None of us can believe honestly ahead of time in the plans of God. We are all like the man that buried his talent for fear that his master was a "hard master"...."demanding stuff with interest". We'd prefer to bury everything in the ground and at least we'll be able to offer that. God believes in returns with interest so much...instead of making too much of the resurrection, He calls His Son home to transplant the same resurrection into thousands of us. I'm rambling...but this really is the background to what I want to say about unity. For four years we have scattered seed on the net, and there has been fruit, and people have caught hold of new stuff they have never heard before. But have you also noticed there are some humongous divisions of belief, schisms and cliques? Have you also noticed that screes of writing later there still are the same groups and separate forums and belief systems. where two or three gather in My Name there am I in their midst. they are a group visited instead by the One Lord Jesus Christ. who is also so mirrored. So unlike Facebook where Ken Dahl can hold court over a particular set of preterist beliefs for literally years on end, and never really be challenged.....OK people like me attempt it....but all he hears is "just another idea"
all vanish like mist before the actual Presence of the Living God. I would say ...approximately 20 minutes...that's all. Pianos go on for years with strings that slacken approximately up to 3 or 4 semitones, beyond which they rarely fall. And there they sit for decades possibly in houses or old halls. The most it ever takes is 90 minutes....usually 45-50. Are any of you hearing in the Spirit what I am saying about the prophetic significance of Nehemiah 8? The gathering in the square. Cutting covenant. But it's based on proper GATES and WALLS. And one of which is the INSPECTION GATE. Spirit discernment IS IN THE BODY. Spirit discernment is in your spirit. Jesus in you knows what isn't Jesus in you. A priesthood learning what the Melchizedek order is. Schooled and trained in Psalm 123 , looking unto the smallest move of the eyes of the Master, as a servant does....knows now what a SINGLE EYE IS. Knows what is God going on. Has trained their senses according to righteousness. Can you think of anything more sinister than an inspection Gate patrolled by Nazis, or Russian Communists, or worse still Ofsted Inspectors? Supposing Job's friends were in the Inspection Gate? They tried to be. We have 35 odd chapters of their inspecting. Third Level Gatherings are not like that. Why? Because Truth just isn't the hazy thing that Lucifer has been teaching the world it is. But at the Good end of his Tree...it isn't a black and white leftbrain construction of Good either. That also is the devil. But that's another post. Here's the fantastic thing about piano tuning and also about the Body of Christ...and natural bodies. There's no hazy truth. A piano is perfectly in tune when you can play in all 12 keys equally. Strings are in tune when the sympathy between the strings has additional force. The sum is greater than the parts!!! The Body of Christ is in tune when it can hear /see the Melchizedek order and act in alignment. A natural body has a complete homeostatic system to regulate every single aspect of right functioning. The Holy Spirit in believers is the same. In the Old Testament, the big difference is the people were addressed by one man in Chapter 8....Ezra the scribe. Now, God is teaching His Body to move as One. Guess certain ones will lead as God indicates, and present their twopennarth....but really by now it should be the whole Body knowing how to plug into the frequency of the Melchizedek Order. "Doing only what they see the Father doing". So hang onto your seatbelts! So the Spirit is well able to achieve in terms of unity when the right equipment and systems are in place....what pastors and wrong structures operating in fleshly wisdom have been unable to accomplish for two thousand years.